I have been thinking about the Mob and Gangsters lately because I’m trying to figure out the plot of my next book in the contemporary series. Tony Accardo is a complicated guy and purported to be the Godfather of Chicago. I grew up on the Northwest Side of Chicago where the Italian mafia was notorious. Not for the fedora’s and the machine guns of the 1920’s but the drugs and explosions of the 1980’s. So this made me think about some of the dark places where gangsters meet and even place where they go to die. The Biograph Theatre was designed by architect Samuel N. Crowen in 1914, and has many of the distinguishing characteristics of cinemas of the period, including a storefront-width lobby, recessed entrance, free-standing ticket booth, and canopy marquee. The building is finished with red pressed brick and white-glazed terra cotta. Most of the movie houses in Chicago were built in neighborhoods during this time period offered air-conditioning and live organ music that was a big draw. The Biograph Theater on Lincoln Avenue on Chicago's North Side is the infamous site where, on July 22, 1934, after attending the film Manhattan Melodrama with brothel madam Ana Cumpănaş and Polly Hamilton, John Dillinger was shot dead outside the Biograph by FBI agents led by Melvin Purvis, when he attempted to pull a pistol and flee into the crowd after he saw them. Dillinger's whereabouts had been leaked to the FBI by Cumpănaş under the threat of deportation back to her birth place of Romania. The exterior of the Biograph was temporarily restored to its former glory for the filming of the Johnny Depp biopic Public Enemies. 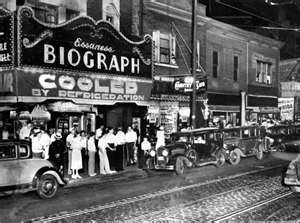 In July 2004, after 90 years as a movie theater under various owners, Chicago's Victory Gardens Theater announced it had purchased the Biograph for use as a live venue. The theater has been completely renovated by architect Daniel P. Coffey. Part of the original structure, a grand staircase was restored to lead up to the building's second floor, housing a studio theater seating 135 people and an adjacent rehearsal/multiple-use space. So gangsters aren’t just in the movies, they’re at the movies, too. This post inspired a meeting between Accardo and someone at the Biograph Theatre. The question is who is he meeting and why?